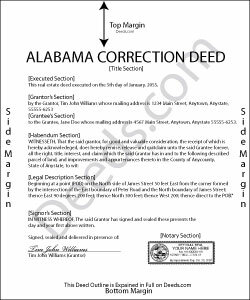 A correction deed is an instrument used to correct an error in a deed that has been recorded at an earlier date. In order to correct a prior deed on record, use a correction deed, which must be notarized and recorded at the same county agency as the earlier deed. The correction deed makes specific reference, by execution and recording date, as well as instrument ID or book/page number, to the earlier deed and rerecords it in its entirety. It states the type of error made and adds the corrected information in the respective section of the instrument. All parties who signed the prior deed must sign the correction deed in the presence of a notary. Samuel J M. said: I needed to prepare a Correction Warranty Deed and have not done so in years. I ordered your form and modified it to fit my situation. Saved me a lot of time. Thanks.